Online reservations are not currently used by this restaurant, but you can call (803)521-5063 to see if they will take your reservation. Chef George V. Kessler, originally from Hoboken, New Jersey, has over 25 years of experience in the food and beverage industry as well as the travel industry. His experience in the food industry began in Columbia, South Carolina in 1985. He worked for the Marriott Corporation in Columbia, SC and Park Ridge, NJ through 1992 as a Kitchen and Restaurant Manager. He also served as Executive Chef at Town Tavern in the Heart of Palm Beach Hotel in Florida and at Zampella’s Restaurant, a family owned Italian restaurant in Hoboken, NJ. He attended the University of South Carolina where he minored in Italian studies and spent a summer studying in Urbino, Italy. Since that time he has traveled extensively through the various regions of Italy. George completed a course in pasta-making at La Scuola Vecchia in Bologna, Italy in 2007 and completed a course in Italian cooking at Casa Ombuto in Tuscany, Italy in 2010. During 2010 and 2011 he completed multiple courses at the Institute of Culinary Education in New York City. As a result of his travels through Italy, Chef George’s philosophy is much like that of everyday life in Italy, i.e. Keep it simple, Keep it fresh, Keep it regional. With the opening of il Giorgione, George is seeking to bring the diversity of authentic, regional, everyday Italian food and wine to Columbia, SC. It has been a dream of his to share some of his authentic Italian culinary experiences with those in Columbia. He believes people will enjoy the mozzarella cheese that he makes fresh daily, the use of fresh herbs from the herb garden in restaurant courtyard, the Roman style thin crust pizza, the traditional pasta dishes, and the Italian desserts all homemade at the restaurant. 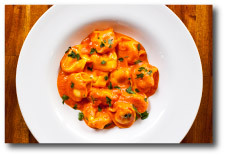 This, together with a pairing of food with regional Italian wines, is sure to result in a wonderful dining experience.